When Ryuk the Shinigami (Japanese god of death) gets bored, he decides to liven up existence by dropping his Death Note on Earth. This Death Note has the power to kill whomever’s name is written in the book, as long as the person can visualize the face while writing it. 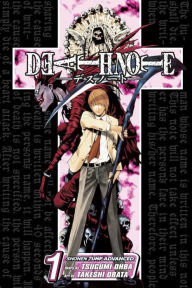 A teenager named Light Yagami finds the book, and decides to use the book for good by killing murderers who have gotten away scott free. But he doesn’t account for the police force (including his father as assistant chief) teaming up with L, a mysterious crime-fighting genius. The law wants to keep the law in its own hands, and Light needs to outwit his pursuers. Well, at least, that’s what the first book is about. There are 12 of them altogether, and the series is thankfully finished. I could go on and on describing this twisty plot. This is my first manga and I enjoyed it on and off, though I can’t really compare it to other manga. I really loved the beginning and enjoyed the ending. The middle seemed to get a bit too twisty and had some I-can’t-believe-that-just-happened moments. Overall, an excellent choice. And I hear the anime is fantastic as well. Previous Post What do you look for in nonfiction?